Presentació del llibre La vida material de Marguerite Duras. A càrrec de Maria Bohigas i Pepa López. Mac's welcomes Kazim Ali and Libby Murphy, translators of L'Amour by French writer Marguerite Duras. L'Amour was recently published by Open Letter Books a small literary press devoted to works in translation. Marguerite Duras was born in Giadinh, Vietnam (then Indochina) to French parents. During her lifetime she wrote dozens of plays, film scripts, and novels, including The Ravishing of Lol Stein, The Sea Wall, and Hiroshima, Mon Amour, and was associated with the nouveau roman (or new novel) French literary movement. Duras is probably most well known for The Lover, an autobiographical work that received the Goncourt prize in 1984 and was made into a film in 1992. She died in Paris in 1996. A man—the traveler—arrives in the seaside town of S. Thala with the intent to abandon his present, and instead finds himself abruptly reintroduced to his past. Through his subsequent interactions with “her,” the woman to whom he was briefly engaged as a young man over twenty years ago, and “him,” the man who walks and keeps watch over “her,” the traveler is soon drawn back in and acclimated to the strange timelessness and company that is S. Thala. Written in a stark and cinematic narrative style, this sequel to Duras’s 1964 novel The Ravishing of Lol Stein is a curious, yet haunting representation of the human memory: what we choose to recall, what we choose to forget, and how reliable we ultimately decide ourselves to be. Kazim Ali is author of two volumes of poetry, The Far Mosque (Alice James Books, 2005) and The Fortieth Day (BOA Editions, 2008), four books of prose, a collection of critical writing, Orange Alert: Essays on Poetry, Art and the Architecture of Silence (University of Michigan Press, 2010), and the inspirational memoir Fasting for Ramadan (Tupelo Press, 2011)--as well as a mixed-genre book, Bright Felon: Autobiography and Cities (Wesleyan University Press, 2009). Founding editor of Nightboat Books, he now teaches Creative Writing and Literature at Oberlin College and in the University of Southern Maine's low-residency M.F.A. program. Libby Murphy teaches courses in modern and contemporary French literature and in advanced conversation, composition, and textual analysis. Her research interests center on French literature and culture of the First World War, the history of French journalism, and theories of the novel. She has published articles on print culture and the First World War, on literary representations of the French Infantryman or poilu, and on the reception in wartime and postwar France of the films of Charlie Chaplin. She is currently working on a cultural history of the First World War that develops the literary mode of the picaresque as a conceptual framework for understanding the ways in which French novelists, journalists, graphic artists and cultural critics attempted to make sense of the Great War. Marguerite Duras discusses O amante. Marguerite Duras promotes O amante. Born Marguerite Donnadieu in Gia Dinh, French Cochinchina, -- now Vietnam -- she went to France for her higher education. After completing studies at the Sorbonne in political science and law, she became a member of the French Communist Party (she would later be expelled). In the late 1930s, she worked for the French ministry of colonies governing French Indochina. During World War II, she was a member of the French Resistance but was also accused of helping the Vichy government to censor writers. In 1942, for the publication of her first novel, she chose Duras as her pen name for a village where her late father's house was located. Her career as an avant-garde writer took off in the 1950s with works such as Un barrage contre le Pacifique (1950); many of her works were marked by feelings of alienation and the theme of love between people of different races. Marguerite Duras's semi-autobiographical novel L'Amant (1984), about her youth in Indochina, won the Prix Goncourt, France's most prestigious literary prize. Marguerite Duras's book The Sailor from Gibraltar was available from LibraryThing Early Reviewers. Marguerite Duras is currently considered a "single author." If one or more works are by a distinct, homonymous authors, go ahead and split the author. 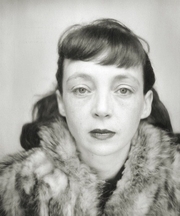 Marguerite Duras is composed of 34 names. You can examine and separate out names.